A Feb. 25 visit to Louisiana for granddaughter Molly Kate’s birthday party included a tour of her family’s new home in Baton Rouge. Tour guide Molly Kate made sure that her bedroom and the princess vanity that she had received for her birthday topped the itinerary. 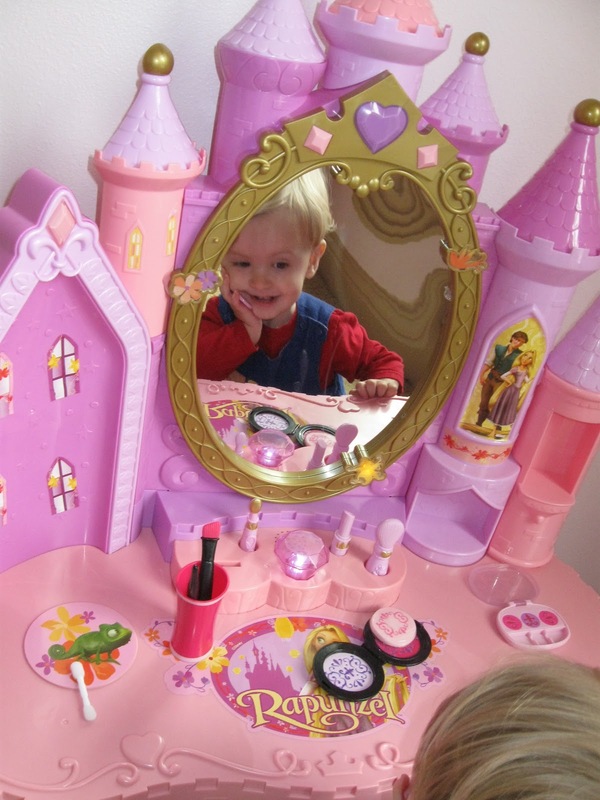 Then while she became engrossed with other birthday gifts she had received, little brother Walker zeroed in on the vanity. 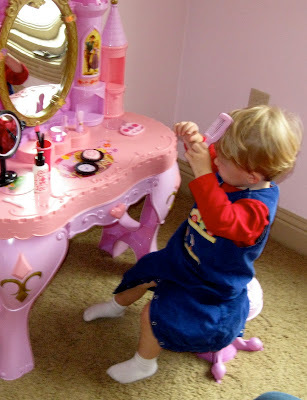 He examined all the pink pretend makeup, tools and hair styling items. The attraction for him was music. Some items, when lifted from their “homes,” triggered music. I had to stifle a laugh during his encounter with a pink plastic comb. First he sat in front of the vanity, observed his reflection in the mirror, combed his hair then held the comb to his ear and carried on a lengthy conversation. 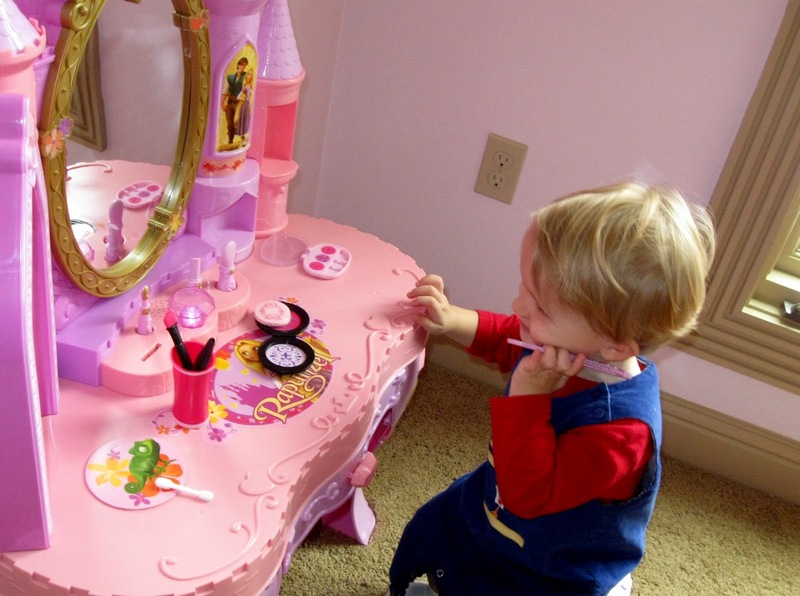 The tiny pink and purple stool that accompanied the vanity held his attention the longest, though. He carried it around the house and set it down in various locations. He experimented with seating strategies. He was unperturbed that some of his more creative seating attempts sent him tumbling to the floor one way and the stool flying off in another direction. No tiaras are in store for Walker, though. His choice of a kingdom is all outdoors, and this perpetual-motion child chooses grass, dirt and puddles over tiaras every chance he gets! Of course, now that I think about it, with an older sister who enlists him to play dress up by her rules, there are probably still going to be tiaras in his future for awhile! Oh, this is just TOO funny! In just a year or two, he will be thinking Princesses are girly stuff not even worthy of playing with. He has a wonderful imagination. Oh so cute, and what amo' you will have in a few years. he is adorable and so is that vanity. they did not have things like that when I was small. With those pictures, you will be able to get him to do anything you want for the next 20 years. Almost like being naked on a bear skin rug. One of those made me a model teenager. That really is a great vanity by the way. Dianne, you have the grands sorted perfectly. Molly Kate is the curly-haired brunette. MK and Walker's dad Jeremy was a blond-haired child but i think that Walker's strawberry blonde may be from his maternal grandmother's gene pool. And big sister is a good sister not to "crown" him for playing with her things. This post reminds me so much of Caden! He used to love Maddie's vanity and tiaras--and her shoes! He still loves to play with her kitchen, but he's like your little Walker--he loves the great outdoors the best!